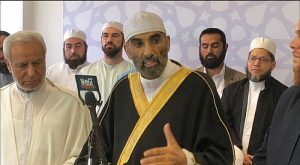 Sheik Afifi was elected Grand Mufti on Sunday. He succeeds Ibrahim Abu Muhammed, who had held the post since 2011. Like his predecessor, Sheik Afifi is Egyptian-born. He moved to Jordan in 1994 and worked for six years as an imam at the Ministry for Religious Affairs before coming to Australia in 2000. He is an accomplished religious scholar who has spoken out against extremists. As president of the Australian National Imams Council, the peak Muslim body that appoints the Grand Mufti, Sheik Afifi labelled terrorism a “disease”. Yesterday, Sheik Afifi, who holds the role for three years, repeated that sentiment. “As Mufti I strongly stand against any kind of terrorism. We want to keep our country, and all countries, safe and secure,” he said. The role of Grand Mufti is a controversial one. Unlike Christian faiths, Sunni Islam has no hierarchy. While structures, titles, office bearers and religious groupings abound, none is universally recognised nor holds effective power over other groups. Earth Hour: What is the Australian Religious Response to Climate Change?